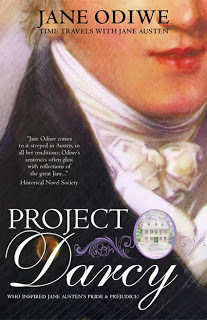 After having enjoyed Jane Odiwe’s Searching for Captain Wentworth, I jumped at the chance to read Project Darcy even before knowing anything more about it other than the title and that the cover promised further Time Travels with Jane Austen. Happily, Project Darcy isn’t about the search for a present-day Darcy or the transformation of a modern-day man into someone’s romantic ideal of Darcy. Instead, it’s the codename of an archaeological dig that aims to unearth the site of the old rectory at Steventon where Jane Austen lived the first twenty-five years of her life. This dig brings together an interesting mix of people and it’s fun matching up those resembling Jane Austen’s own circle or her characters. For example, there’s our heroine, Ellie, and her university friends, Jess, Martha, Liberty and Cara, five girls with initials matching those of the five Bennet sisters. You’ll have to read the book to discover if that’s all they share in common. Almost as soon as they arrive at Ashe, Ellie starts ‘seeing into the past’, something she’s always been able to do and not something this reader ever questioned, I think in large part because Ellie and her best friend, Jess, never do. Both see it as quite normal. However, this time Ellie’s visions and slips back in time feel much more personal than they have in the past and she finds it increasingly hard not to get involved when she is drawn out of a hot summer dig to Jane Austen’s time at Steventon and then, more particularly, to the very winter of Tom Lefroy’s visit. One of the highlights to me of Odiwe’s previous book was how she’d imagined Jane Austen to be, as well as her contemporaries and the characters from her books and their possible real-life inspiration. This holds every bit as true for Project Darcy and I had a great deal of fun reading not only Odiwe’s take on Jane Austen and her circle of acquaintances and their surroundings but seeing how she used fragments of well-known speeches and letters from Jane Austen’s books to show how and where Jane Austen’s inspiration might have come from. I liked the fact that having a twenty-first century heroine slip back in time allowed Odiwe to take a few more liberties than she might otherwise have done in scenes between Ellie and her eighteenth century beau. I also enjoyed figuring out who the modern-day counterparts to Jane Austen’s characters were and seeing how they behaved now that they were in a more contemporary setting and circumstances. The slips between both Jane Austen’s time and Ellie’s own are managed well and Jane Odiwe gives equal attention to both periods. All too often, time slips can feel uneven, with the historical parts of a novel seeming more real or interesting than those set in more recent times. It doesn’t feel that way here and whichever period I was reading about, I was there, totally immersed in it. I really felt as if I got two great reads in one here, rather than one strong story padded out with a weaker one. One of my few criticisms and it is fairly minor and one that I attributed to the ages of the girls and the fact that they might be more over-exuberant in their descriptions than someone older, is that sometimes the description of people, places, feelings and things seems altogether too perfect. However, it didn’t impact too much upon my enjoyment of the story and, like I said, I could put it down to how young the girls in the book are and that the story is told from Ellie’s viewpoint. I thoroughly enjoyed getting to spend some more time with Jane Odiwe’s imagining of Jane Austen, and see what her life at Steventon might have been like. In particular, it was fun to have a closer look at the period when she met Tom Lefroy, to get to dance at the winter parties and enjoy how her romance might have played out, as well as to see what an impact it and Tom might have had on her as a young woman and how their burgeoning relationship might have informed her writing. Equally enjoyable though was the idea of spending a summer with the modern-day characters on the site of the old vicarage at Steventon and then later in London and in and around Bath. I pretty much read Project Darcy in one sitting. Even though I knew at least how Jane Austen’s own story would end, I loved spending time with her again in that period, as well as being anxious to see where the modern-day characters would be at the end of the book – and who with! This was a highly enjoyable read for me because it had a bit of everything: sumptuous period detail – I can imagine that Jane Odiwe had fun imagining the interiors of Ashe, both in Jane Austen’s time and in its more contemporary setting; seeing who the candidates for Jane Austen’s characters were from her own circle of acquaintances and their modern-day counterparts; a good sprinkling of romance and pairings, including a glimpse into one of Jane Austen’s own rumoured romances and the delicious puzzle of piecing all the connections together made Project Darcy for this reader. Project Darcy is out now in paperback and ebook from Amazon UK and as an ebook from Amazon.com. You can find out more about Jane Odiwe from her Author Blog, her website Jane Austen Sequels Blog or you can Follow Jane on Twitter.